Sorry, this entry is only available in अमेरिकी अंग्रेज़ी, 中文 and 中文（繁體）. For the sake of viewer convenience, the content is shown below in this site default language. You may click one of the links to switch the site language to another available language. New Phrasebook UI – As part of our ongoing transition to a new user interface for 2.0, we’ve changed the way Phrasebooks are used, and we think it should now be easier and more intuitive to use. 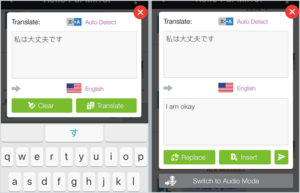 Translation Tools – Advanced language speakers who can already type/write in a foreign language can now access the translator as you type and INSERT translated words into what you were writing. New Chats – To keep your list of chats neat and tidy, all new incoming chats are now grouped together under “New Chats”, and will stay there until you reply to a particular chat. For a full list of changes, tap on Discover > News in the app to see all version revisions. Games – You may remember that we previously mentioned our upcoming Games function when we introduced Leveled Phrasebooks. We are making good progress with it and hopefully you will see it soon along with the release of version 2.0 of Hello Pal. The first game released will a simple Phrasebook challenge game that allows you to play with other users and test yourself on foreign language phrases at the same time. Incoming Chat Filters – We are also hard at work to add filters so that you will be able to automatically filter out incoming chats using different criteria, so as to keep your chat list even cleaner and your experience more enjoyable.